Some festival favorite hotels are listed below in order of their distance from the festival site. 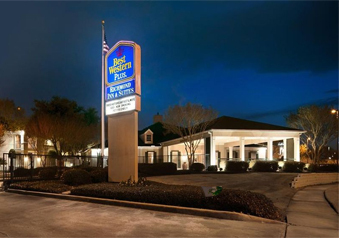 For other hotel and motel options in the Baton Rouge area, search here. Within two blocks of the festival site, Hampton Inn & Suites offers amenities including free high speed internet, in-room refrigerator and microwave, and a clean and fresh Hampton bed®. Catch up with work in thier business center or make the most of your leisure time with a workout in the expanded fitness center. Visit Hampton Inn & Suites Baton Rouge online. In the heart of downtown Baton Rouge, the epicenter of the city's lively pulse emanates from our historic 1927 landmark building. Step outside and discover the culture of Baton Rouge, from the Shaw Center of the Arts to the Main Street Market. With the mighty Mississippi River as your compass, explore a world of art, shopping, dining and adventure in the neighborhoods surrounding our towering landmark. 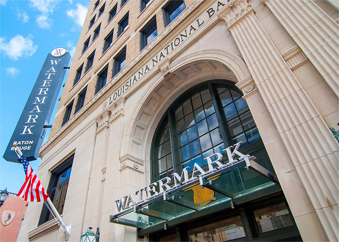 Visit Watermark Baton Rouge online. 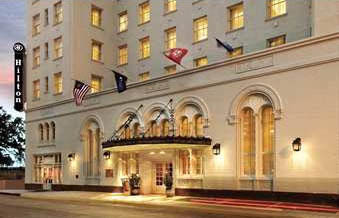 Within easy walking distance of the festival and located on the site of the old Capitol House and Heidelberg hotels, this facility offers 290 elegantly appointed guest rooms, one upscale restaurant, a 3rd floor pool deck overlooking the Mississippi River, 20,000 square feet of meeting space with two river view ballrooms, a day spa and valet parking. For reservations by phone, call 1-800-955-6962 or 225-344-5866 and ask for the Louisiana Book Festival 2019 group rate. 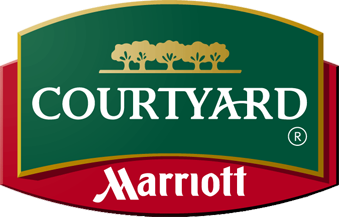 Situated in the heart of Downtown Baton Rouge, our NEW Courtyard by Marriott, expected to open July 2018, will be the perfect place for you to stay and enjoy all the city has to offer. 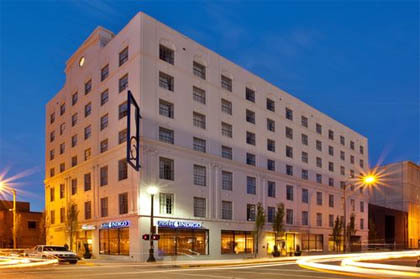 The hotel sits on the former home of Downtown Baton Rouge's first hotel, the Hotel Istrouma. The 135 room Courtyard is sure to wow you with it's comfortable style and unique balcony views. Visit Courtyard Baton Rouge Downtown online. Imagine a 100% smoke free sophisticated boutique hotel, whose focus is delivering guest peace, serenity and renewal. 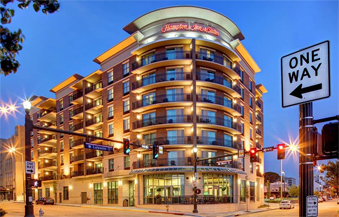 Quite deliberately the Hotel Indigo Baton Rouge Downtown Riverfront has been designed as an oasis for travelers who yearn for an escape from the common hotel, but still desire the convenience of the upscale, casual Bistro and a 24 hour fitness center. Conveniently located at I-10 and College Drive near the I-10/I-12 split. Easily accessed by car, and only a nine minute drive down I-10 from the festival site. Shopping, dining, and nightlife are all within walking distance. 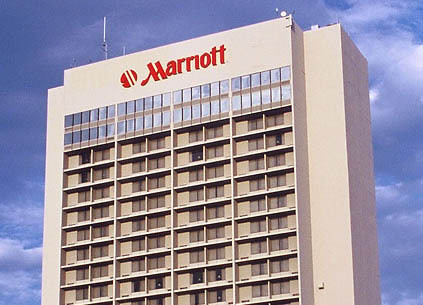 Visit the Marriott Baton Rouge online. Immerse yourself in the comforts of home close to downtown Baton Rouge, the state Capitol building, Louisiana State University and only an hour from New Orleans and the French Quarter. Our proximity to the highway and the I-10 and I-12 split makes us a prime location for business travelers and those looking for quick commutes during their stay. Whether you are headed to a meeting or a plantation tour, it's quick to get there from the Richmond Inn & Suites in Baton Rouge. Visit Richmond Inn & Suites online. 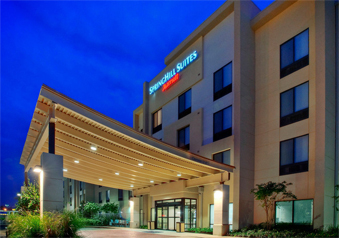 If you are looking for a great hotel in Baton Rouge, you will love the amenities and location of the SpringHill Suites Baton Rouge North/Airport hotel. Our all-suite Baton Rouge, LA hotel is next to Baton Rouge Metropolitan Airport and just minutes from LSU and Tiger Stadium. A very easy 9 minute drive to the Louisiana Book Festival site, we're also close to Exxon Mobil, Shaw Center for the Arts and the Baton Rouge Zoo, as well as the Mall of Louisiana, Southern University, & LSU. Getting around is easy; take our free shuttle anywhere within five miles of our hotel - including the airport.